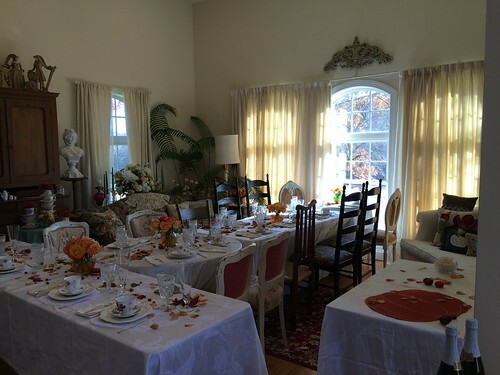 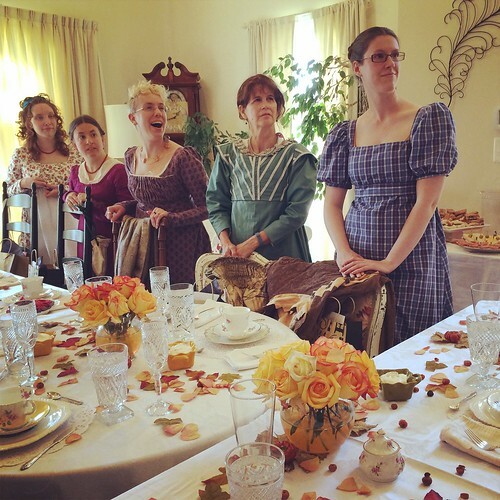 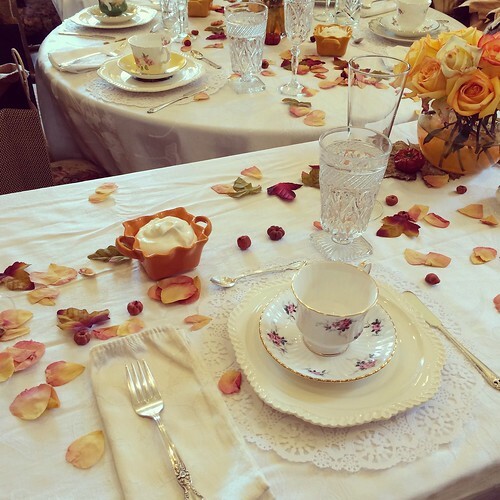 More November catch-up - my Mom and I went to Stephanie's regency pumpkin tea and had a lovely time! 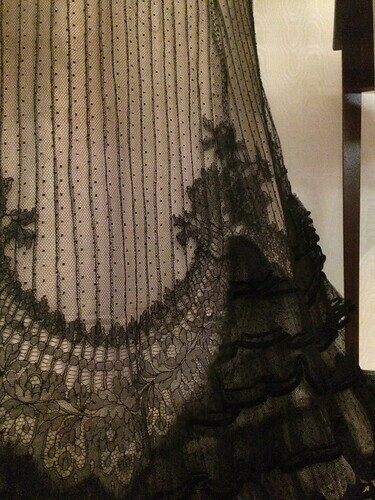 Wearing my new Robert Land shoes with American Duchess stockings, and a vintage petticoat I bought a while ago - glad I had it, it was cold! 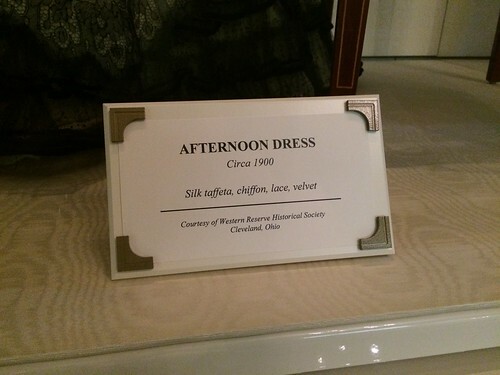 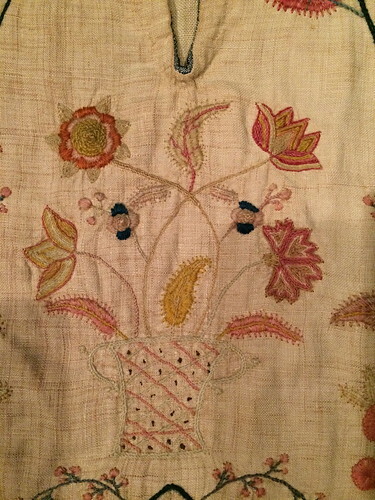 Winterthur also had some lovely extent clothes and other embroidered pieces on display. 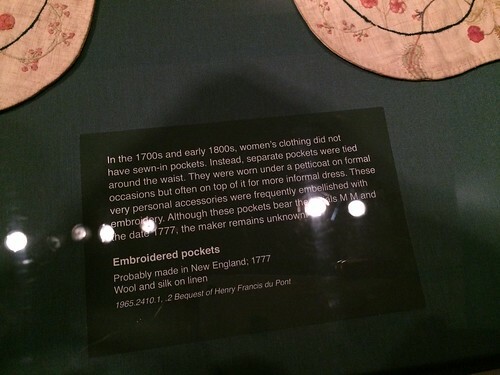 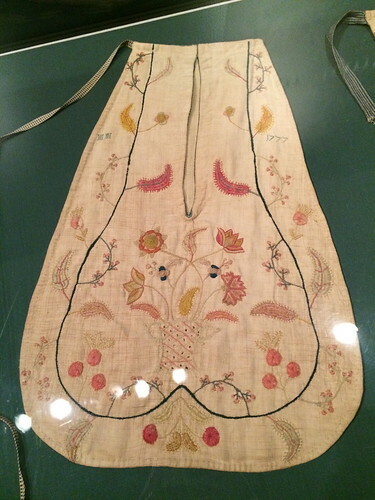 This was a set of 18th century pockets which were *huge*. 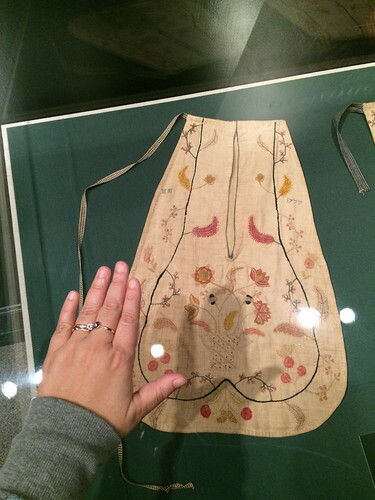 My hand is in one of the pics for scale. 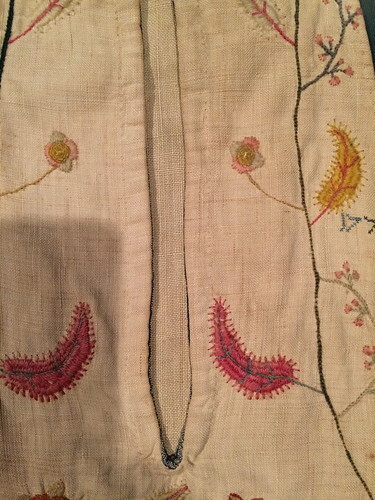 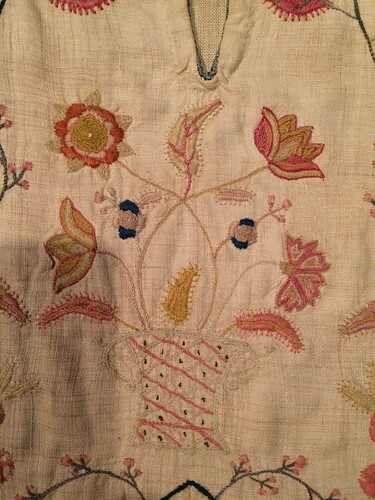 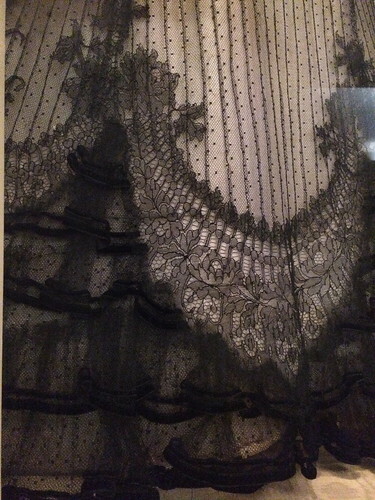 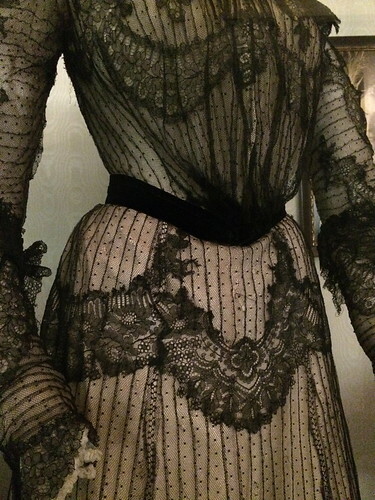 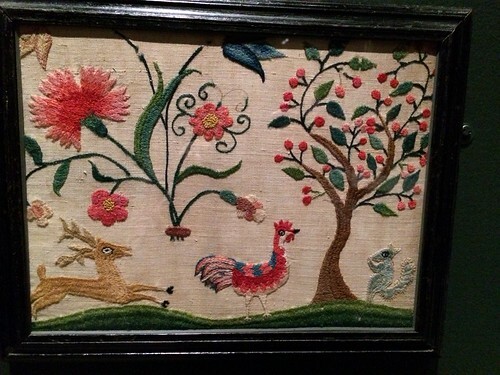 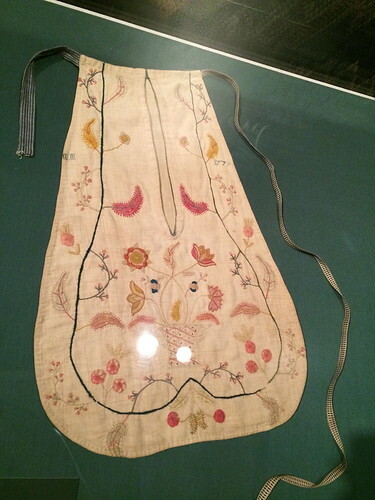 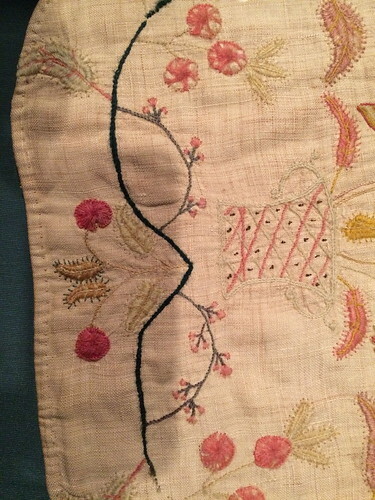 These are pieces that were once the border of an embroidered petticoat - I want one! 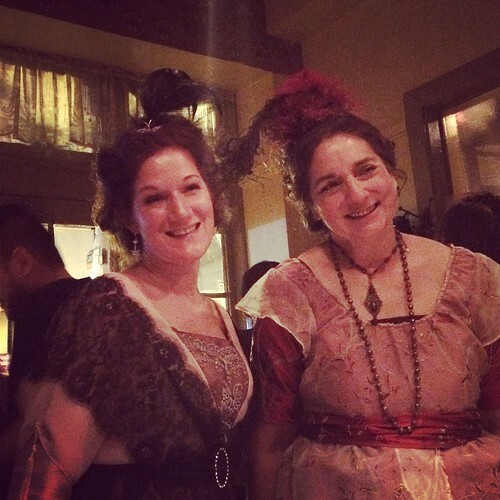 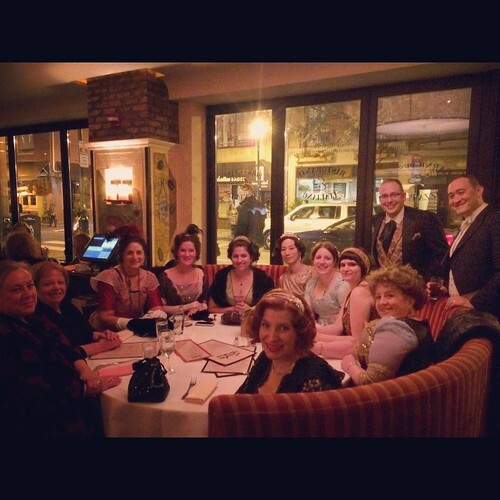 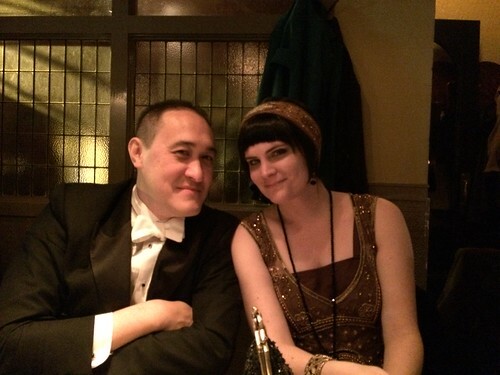 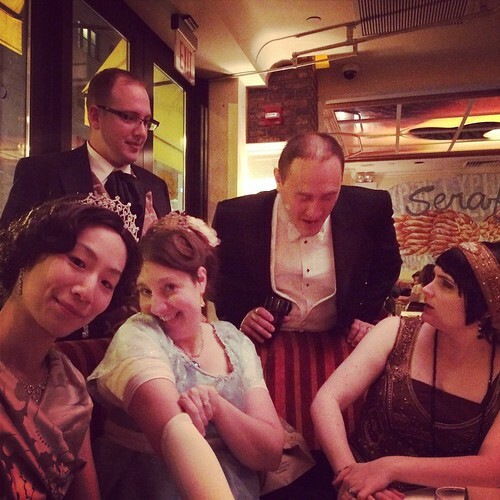 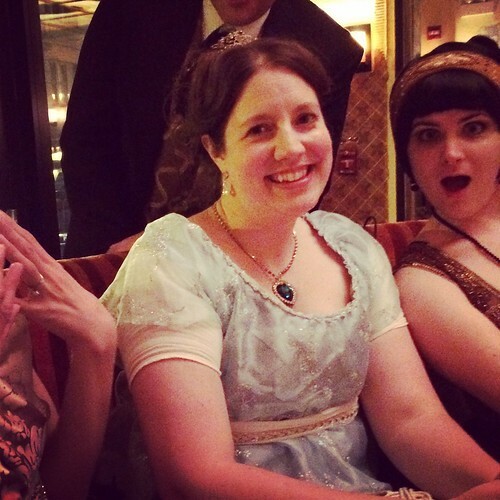 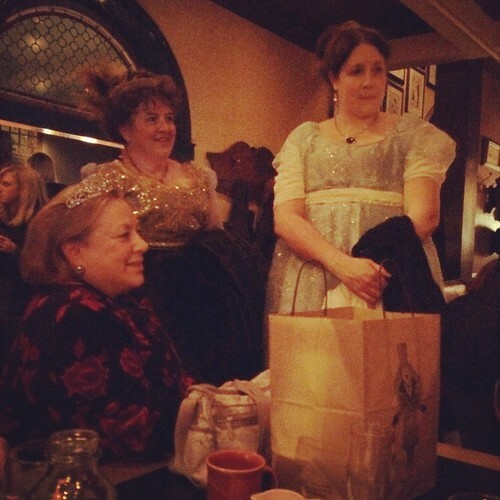 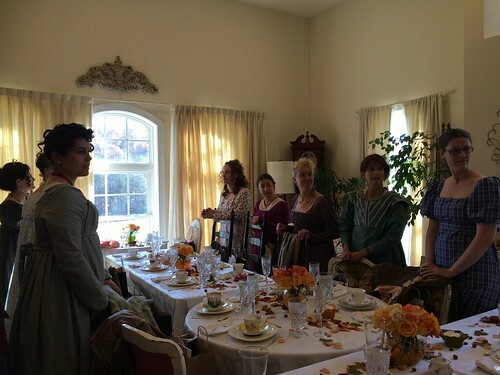 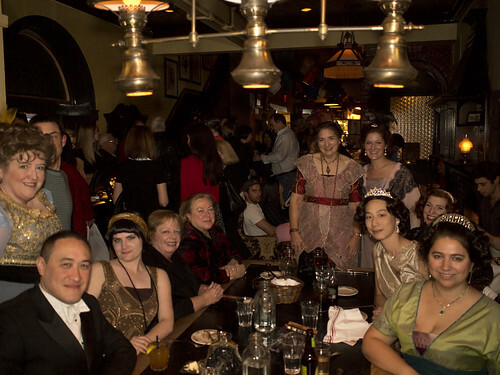 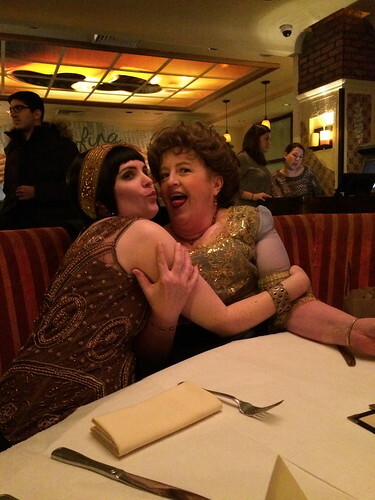 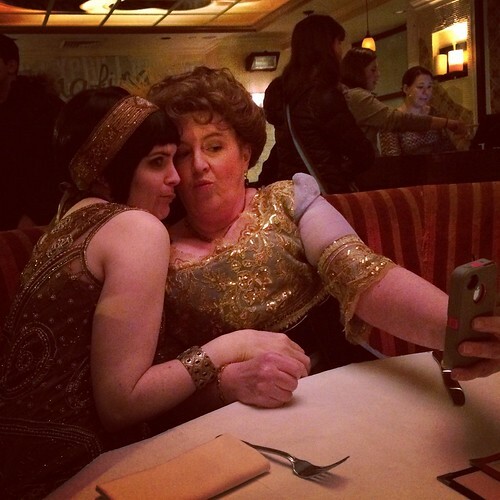 So *mumble* weeks ago in November, Vanessa was in town and a bunch of us got together for a Downton Abbey dinner. 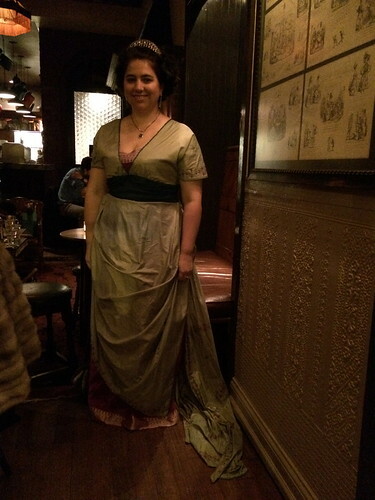 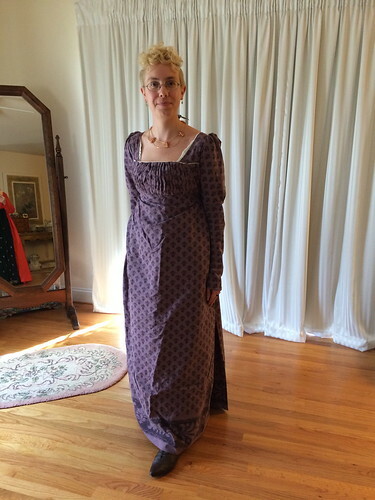 It was super fun and I got to wear the gown I bought from Julia. 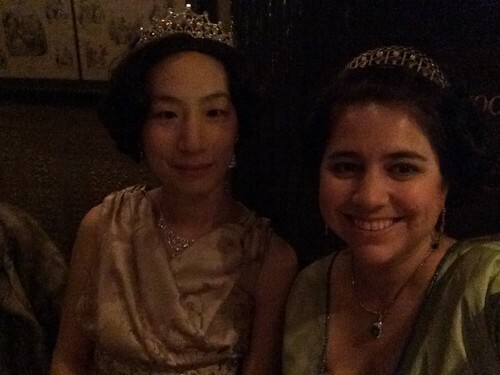 I'd altered it which ended up not being hard, and wore my ebay tiara which was actually the right period. 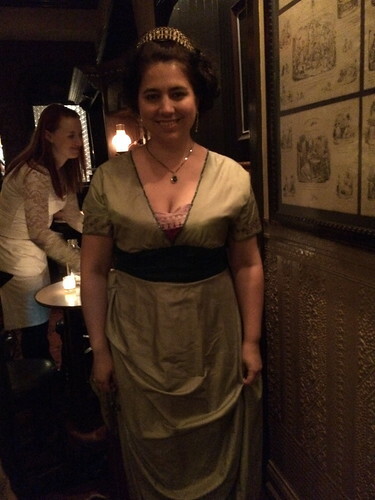 I wore my Jump dress replica earrings and a vintage necklace with a green stone which I may or may not have gotten from Stephanie's mom Linda. 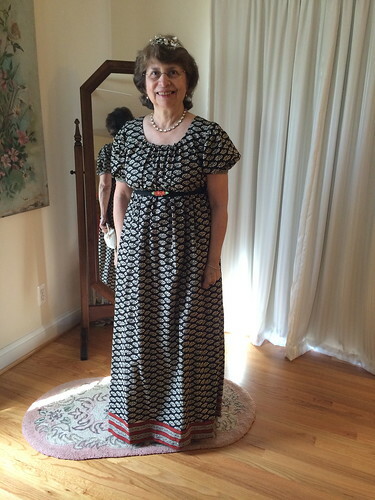 Gloria and I drove up together, which was fun - and we crashed at her parents house. 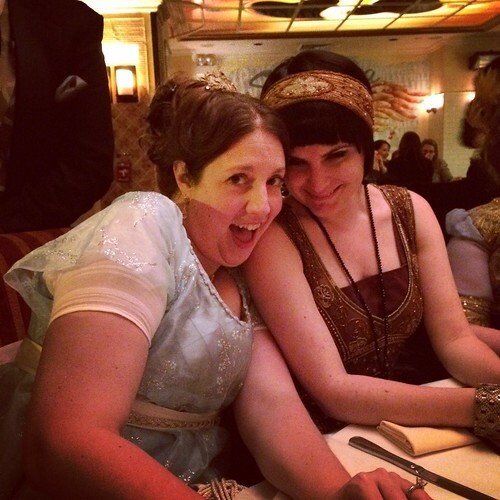 All and all the trip went really smoothly! 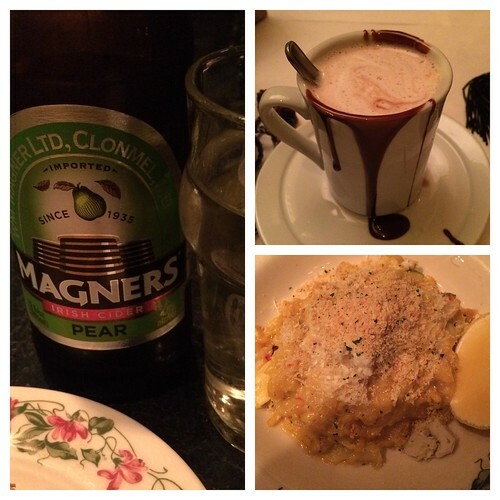 Dinner - the food was fantastic - we had to sit at two different tables that were separated by floors, which was a shame, but we somehow managed to find a place right next door after dinner where we all sat together and had drinks! 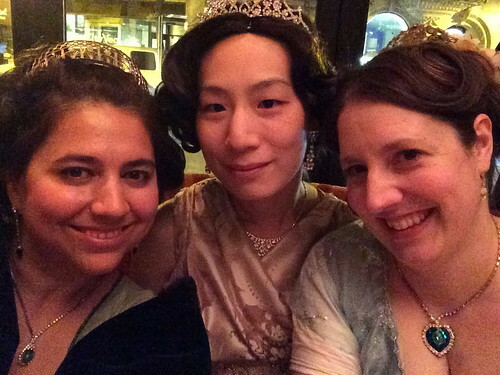 So a successful evening! 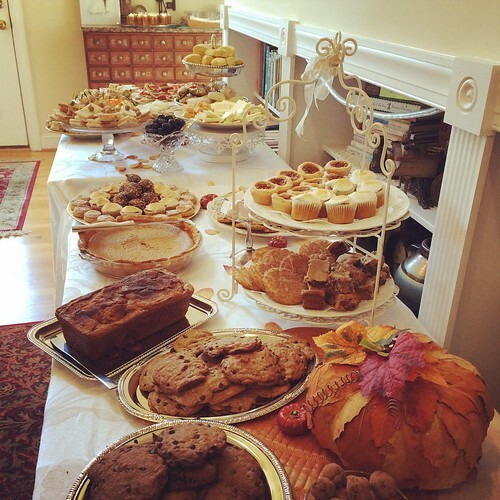 Anyone in the DC area? 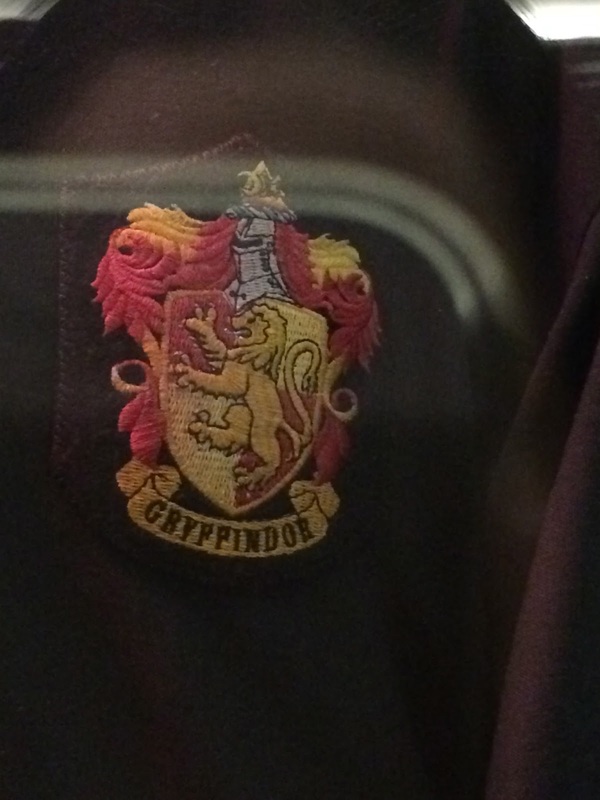 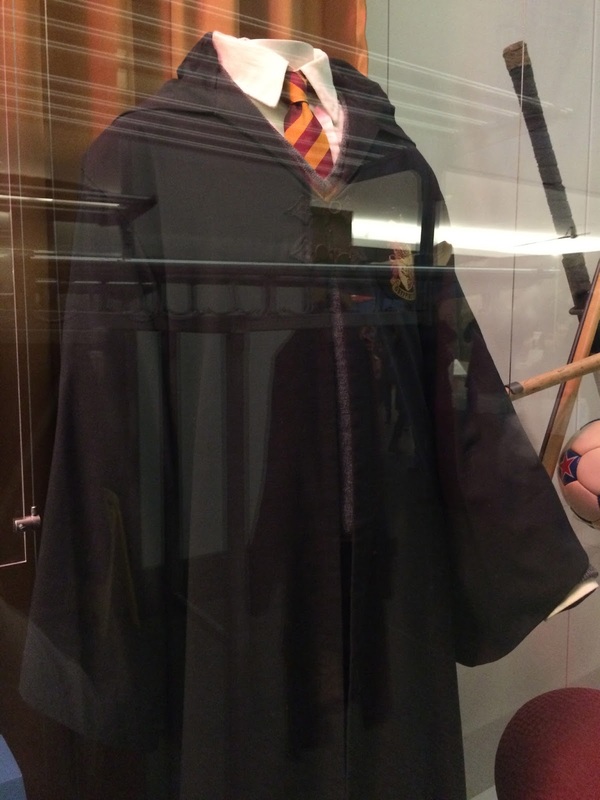 The Smithsonian Museum of American History (which also houses pop culture stuff) has one of Dan Radcliffe's Gryffindor uniforms on display in the glass cases right in the lobby! 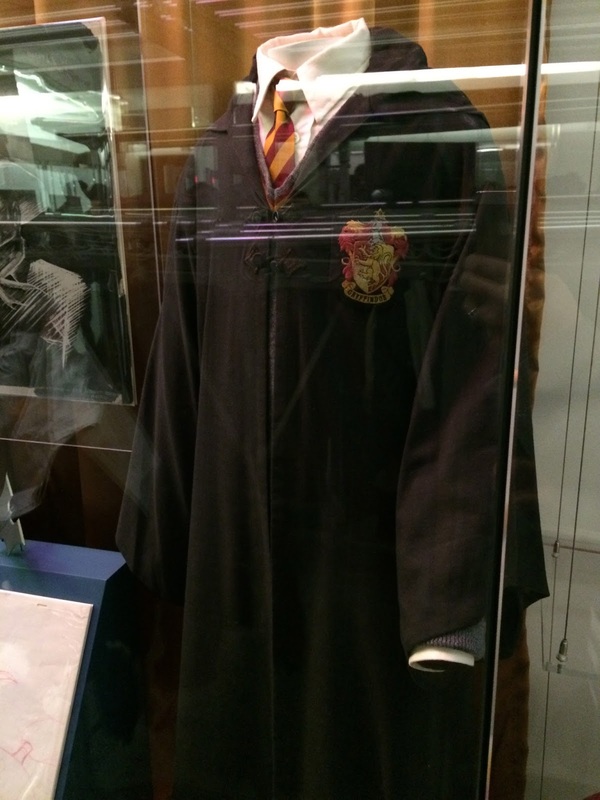 It's a bit hard to photograph behind the glass, but here are a few pics. 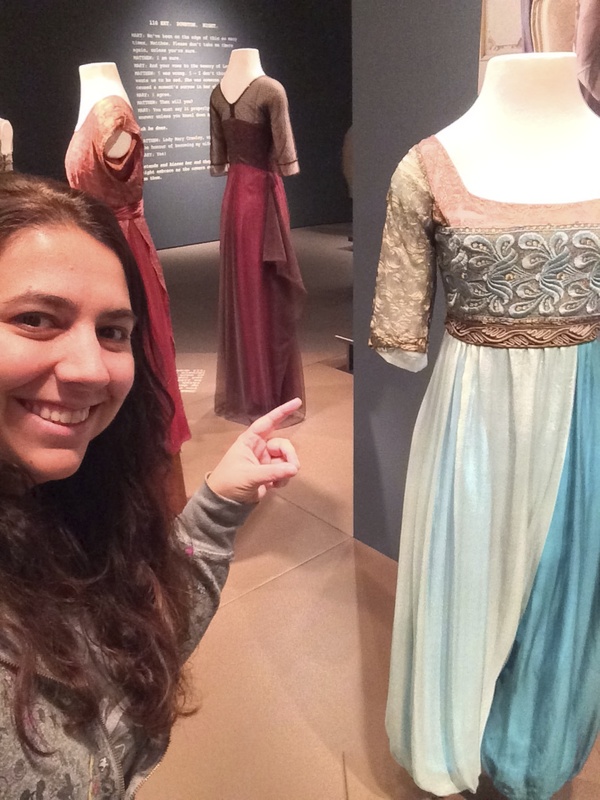 If you're in the area, you might want to take a look! 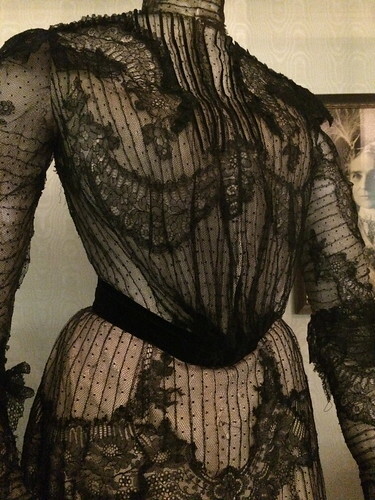 So I spotted this one on ebay and it was unlike anything I'd seen before or anything I've already got in my mostly Victorian Maggie pin collection. 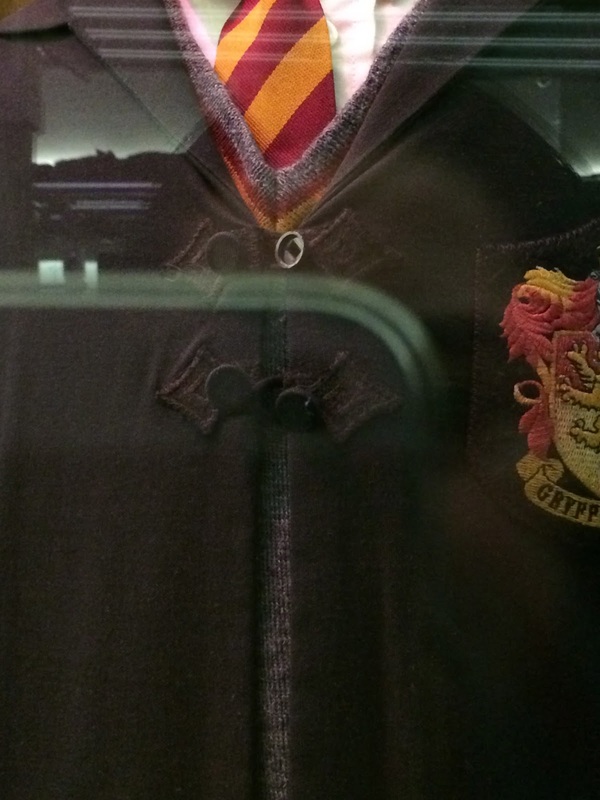 Can't wait to get it in the mail! 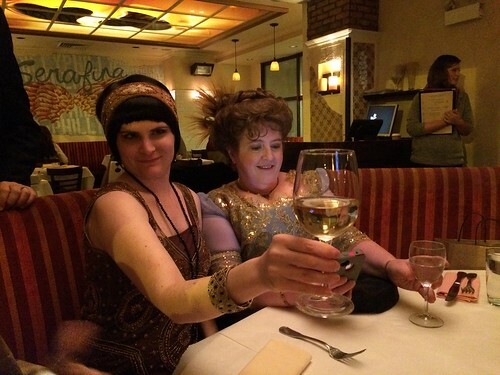 Last year the Arlington Library did a benefit that was Gatsby themed. 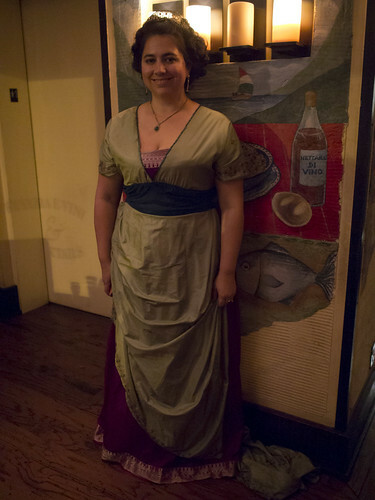 This year it was James Bond: To Russia With Love 1950s themed. 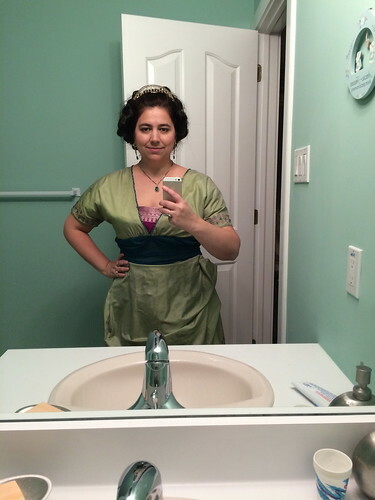 I decided to go all vintage. 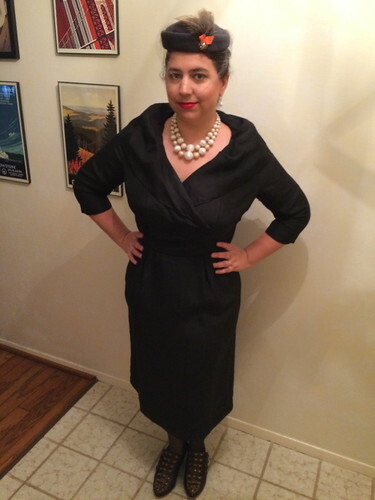 I found a black 50s gown on Etsy that fit perfectly, a 50s hat from Madge's Hatbox, a 50s purse, a giant 50s necklace (the first one I found broke in the mail on its way to me so this was actually the second one I ordered and was even more perfect). 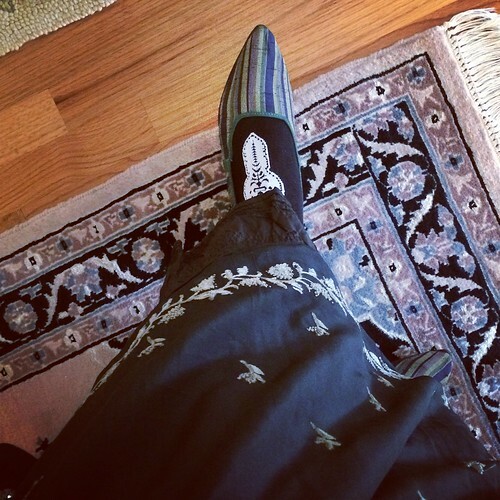 I bought some 50s shoes, but they were too small so I sent them back and just wore my Edwardian American Duchess shoes. 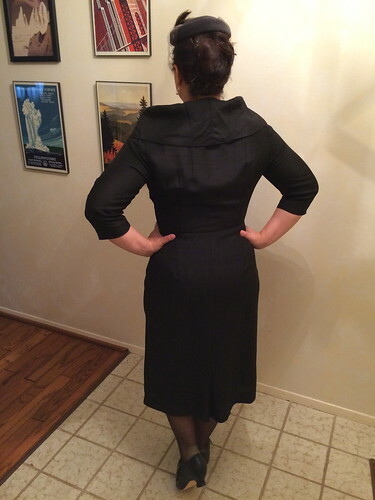 I bought seamed stockings on Amazon, but they were apparently made of spider silk or something and got two runs as I was putting them on. 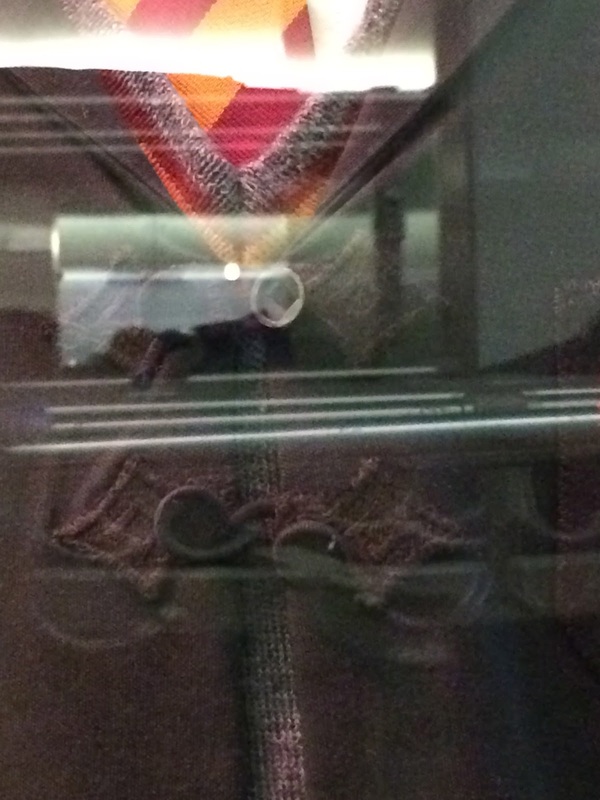 So I complained and got my money back on those. 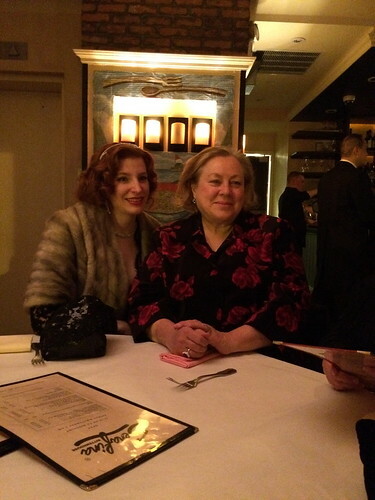 Oh, and then I decided I needed faux fur so for $4.99 on ebay I found a 50s velvet short cloak with faux fur. 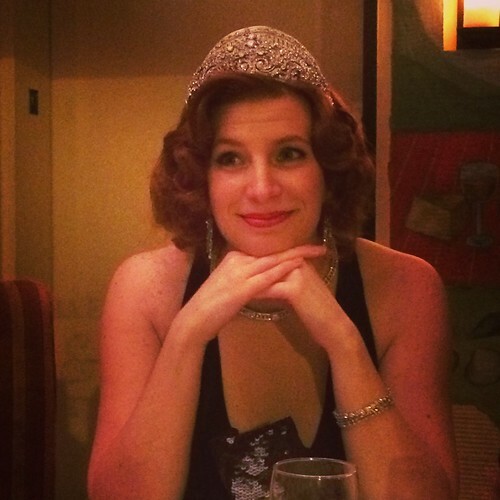 I tried to do a sort of French twist with my hair - it was mostly covered by the hat. 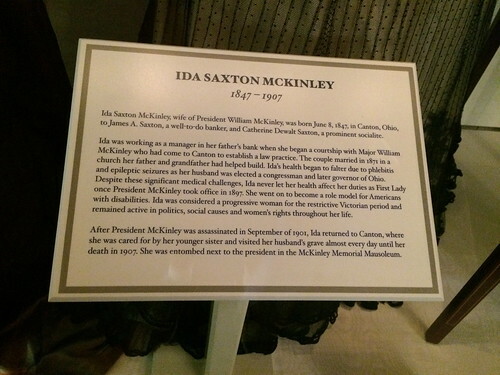 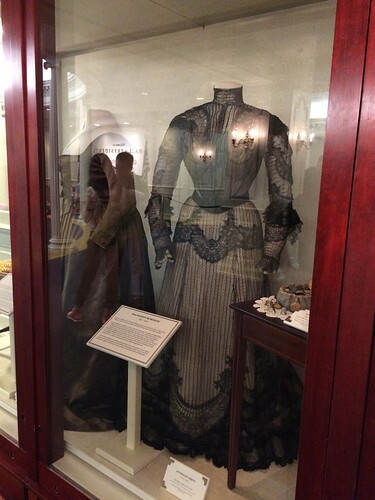 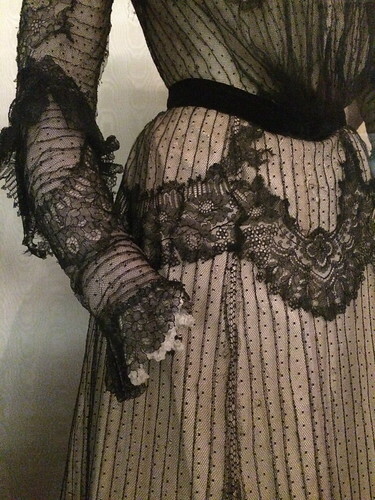 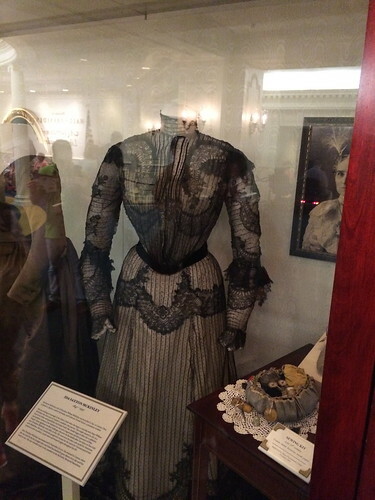 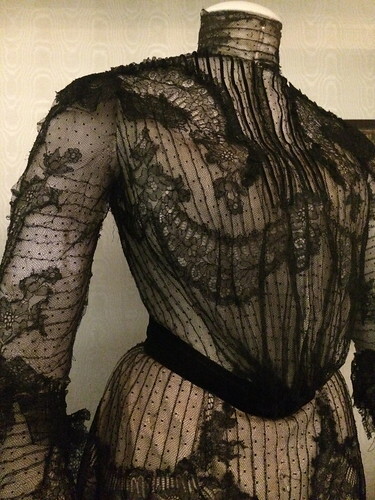 They had a new dress up at the Magic Kingdom Hall of Presidents (new to me anyway) - Ida McKinley's gorgeous black lace pigeon-front dress.